Simple and delicious one-pan supper. 1. Preheat the oven to 200°C, gas mark 6. Cook the potatoes in a pan of boiling water for 5 minutes or until just tender. Drain, then tip into a large, shallow roasting tin and scatter over sliced peppers. 2. Place the olive oil, basil leaves, lemon zest and juice into a small blenderwith some seasoning and blend until coarsely chopped. Pour over the vegetables and toss to coat. Roast for 20minutes. 3. Turn up the heat to 220°C, gas mark 7. 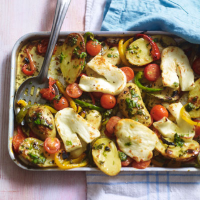 Add the halved tomatoes and sliced halloumi to the tray and roast for a further 5-10 minutes or until the cheese is golden brown. Serve straightaway. Try this recipe with diced feta in place of the halloumi. This recipe was first published in Fri Jul 12 12:22:00 BST 2013.